Other: Wi-Fi internet access, E-mail & printer service, Laundry facilities, Beauty amenities, Air conditioning, Hydro-massage. and her inviting interior is in excellent condition. Extremely spacious, with flexible accommodation and fantastic Sun Deck, Vento is an incredibly inviting motor Yacht, which switches effortlessly from a family charter to a sophisticated escape. 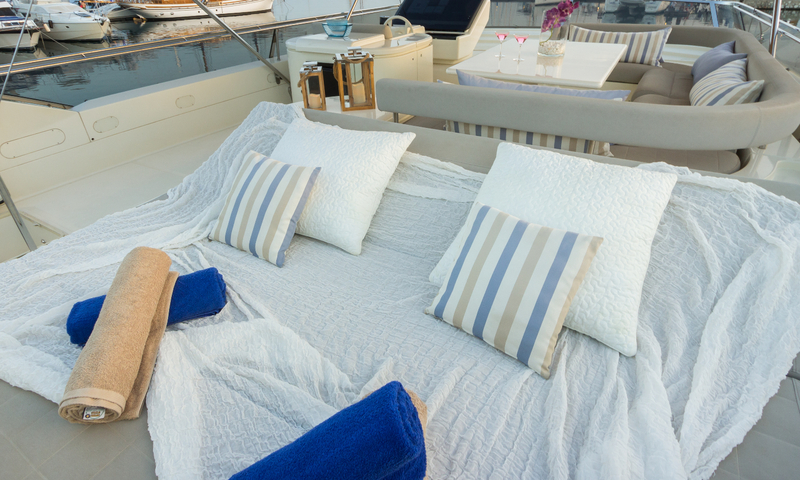 Her contemporary décor, layout, furnishings and finesse, impress all who board her. Vento comfortably sleeps up to 10 guests in 4 staterooms, including an impressive full beam Master cabin, one VIP cabin and two twin cabins. The two twin cabins can be convertible upon request. She is also equipped with a variety of toys, such as a Jet Ski 2 seater Sea Doo 4,20m Tender with 40hp engine. Stand up Paddle board, Ringo tube, Water skis, 1 seat Kayak, Fishing gear, Snorkeling gear and a bicycle. Refit in 2018 improves her perfect condition and she is ready to welcome her guests onboard! Copyright 2017 Ionian Ray. Proudly Crafted by K&M CREATIVE.